The SNPA GF variant was good. It had a nice level of hoppiness, not too bitter and quite a well balanced beer. I'll be rebrewing this in the near future. Might become a regular summer beer. This also rated well with one of my regular beer testers. If you give it a try be sure to let me know what you think. Please excuse my crappy photo. It was a little clearer than the photo portrays. So I've tested the SNPA clone bottles carbonated with the Demerara Sugar. I'd say this doesn't help the taste much and as more demerara sugar goes in, the head retention gets worse. So back to the drawing board. Might need to try some other carbonation sugars. The Sierra Nevada Pale Ale GF clone is going well. Had a taste of a bottle to see how it's going and it tastes great. Should be ready in another two to three weeks. I'll take a bottle into the homebrew meeting for some feed back. The Little Creatures Bright Ale GF clone is still in the fermenter for another week. Taste tests for this are really good, wife says it tastes like normal beer, moreso than others I've made. I'll be using this base for a Bright Ale No-Wheat Wheat beer. Today I finished off a gluten free ginger beer brew. This is my first trial batch, so if the results are good I'll be sure to share the recipe. The aim is to have something light to drink during summer. Also ginger is quite good for Celiacs. This beer has now been bottled and is sitting in a warm cupboard carbing up. Keeping on with my trials, two 330ml bottles received 3mL's of espresso and some other bottles were carbed with demerara sugar. Should have results back from the trials in four to five weeks. 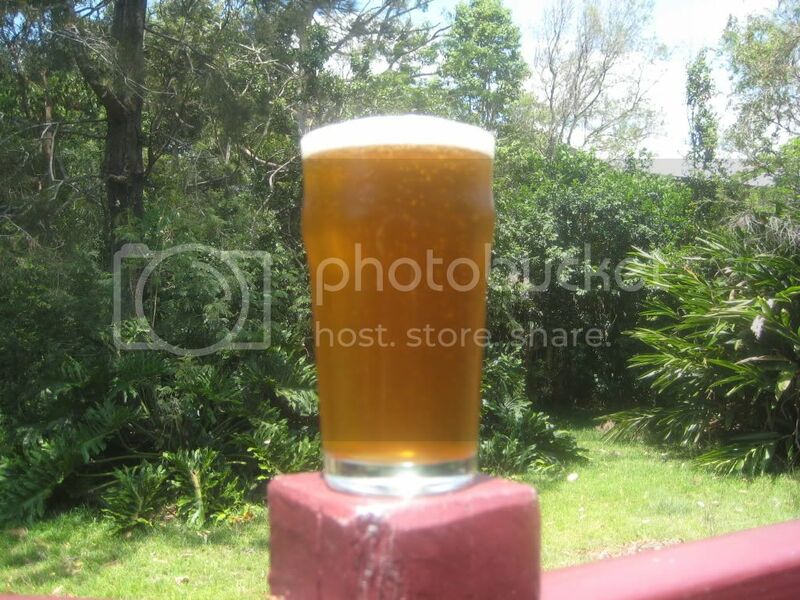 This is a gluten free variant of Little Creatures Bright Ale clone created by "Tony" on Aussie HomeBrewers Forum. I bottled some beer for trials with different carbonating sugar in 330ml bottles. I wanted to see how it would affect flavour and if it would be good or bad. These are the results. Please keep in mind this is carbonating my All Amarillo IPA with a Sorghum base, so some of the off flavours might not be apparent in barley beer. Feel free to share any other carbonating sugars you have tried and recommend. 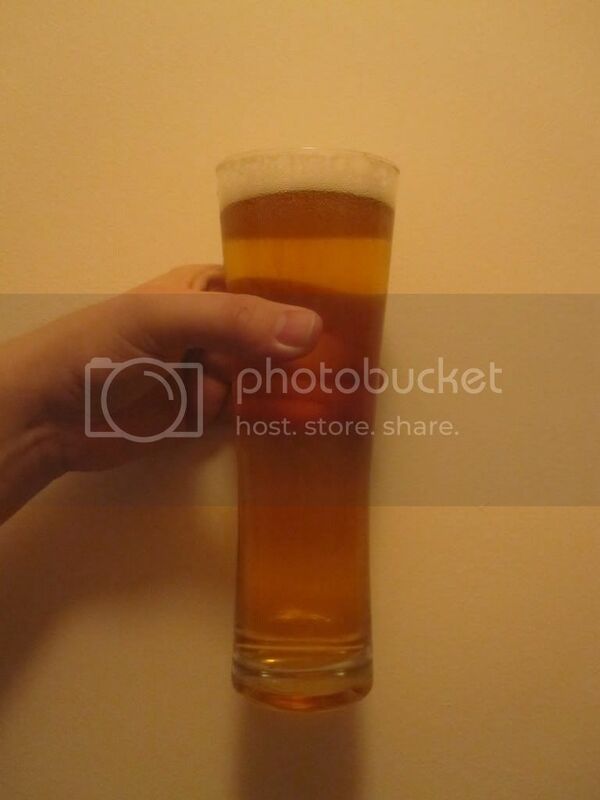 T1 – Plain Sugar – This was the control beer. T2 – Demerara Sugar – In America this is called Brown Sugar, looks a lot like raw sugar and is used in candy production. This added a great depth of flavour, not apparent in the plain sugar. It also took away the sweetness/sourness of the sorghum. Not great head retention or effervescent like the plain sugar. T3 – Dark Brown Sugar – Refined sugar with molasses added back in. This gave off a metallic aroma, however it wasn’t apparent or noticeable in the taste of the beer. T4 – Maple Syrup (Queen Brand) – This didn’t add a maple flavour to the beer, but it was quite pleasant like the Demerara sugar. Also the same carbonation properties of the Demerara sugar. Due to its cost in Australia, it would not be suitable for carbonating beer. T5 – CSR Golden Syrup – This had an overwhelming metallic flavour which was horrible. Definitely not using that again. What I’ve learnt from these trials is that I should experiment more with Demerara sugar. I’m planning to try a future brew with five different sugar combos. I used the Sierra Nevada Pale Ale for the skeleton for this recipe. I've added more Cascade hops, and thrown in some Citra Hops at 15 minutes. I was hoping to use Amber Candy Syrup but the delivery didn't arrive in time. I have tried a sample from the fermenter. Damn it tastes good. Hoping to have this in bottles within a week or so. This could become a regular house brew. This has been a big success. Still room for improvement but the yeast delivers some great flavour. The feedback from the local brew club, is that the flavour is great, however it was lacking on the malt flavour. Which is understandable because I'm not using any type of malt yet. I'd really like to use this as a basis for a blueberry wheat style beer. I've been meaning to do an all Amarillo Beer for a while, I think the aroma is great. So following the hopping schedule for my Centennial IPA I decided to brew this. 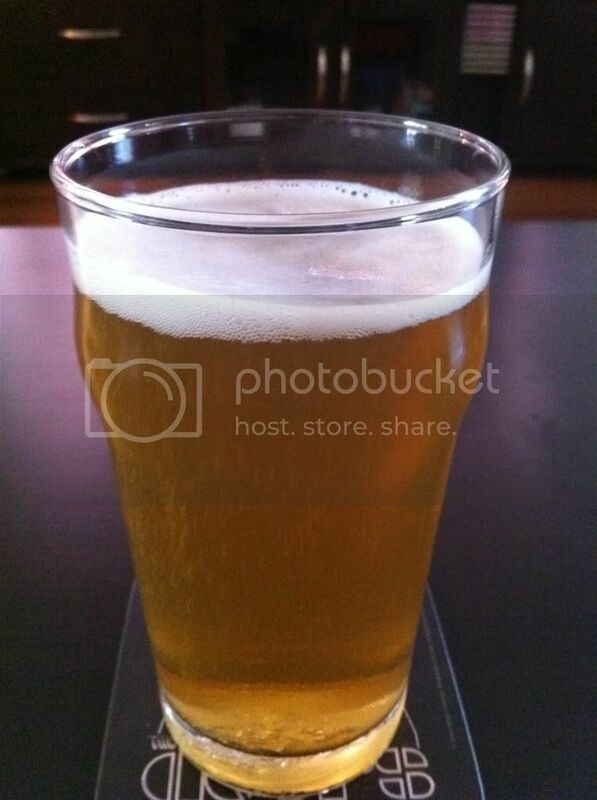 I would like to try making a 10 minute IPA in the future, but for now I'll stick with the basic IPA recipe. Edit: After talking with Doc from Doctors Orders Brewing, I doubt I'd do a hop burst / 10 minute IPA in the future. As he said it really misses that bittering component. Which I really think makes an IPA. Might be good for a Pale Ale though. Had a preview sample of this beer from the fermenter. This is looking like one of my best so far, it tastes fantastic. I'm getting orange and stonefruit flavours through. Can't wait till it's ready to drink. With two days off from work, what better to do than brew some gluten free beer. I missed the supply of Blood Oranges in Brisbane (I saw them for one weekend at the markets). So with Tangelo Oranges well in season and their skins smelling fantastic when pierced, I decided to re-do my orange and coriander beer. If using normal oranges in place of Tangelos, peel an extra two Orange skins. Just over a week ago I bottled my third attempt at the Belgian Triple. Just waiting now for it to bottle carbonate. The sample tastings all the way through have been fantastic, so I'm hoping this really delivers. I also re-brewed the Centennial IPA which I really enjoyed last time. The original recipe can be found here Centennial IPA . I did make some changes with the re-brew, 3oz of Tapioca Maltodextrine @ 60 minutes, 250g Demerara sugar @ 60 minutes and few extra grams of hops at flame out. I think it was a mistake filling the fermenter to 22L, should have stopped at around 21L total volume. I dry hopped twice with 10g instead of once with 10g so this should have more aroma than the last batch. If this beer is successful, I'm hoping to follow the lead of the great brewers (brewdog and mikkeller) and produce some more single hop IPA's. Not a fan of this beer. For it's appearance it's almost perfect. It pours with a lovely head and retains it for a long time (15 to 30 minutes). I'd say probably the biggest fault is that it ended too dry, could do with being sweeter. Also the suggestion from Randy Mosher was adding the saffron to the secondary, which I didn't do. And I should have put some orange peel and pepper (or grain of paradise) in the boil. I think what really attracts me to Belgian Beers is there is no real retrictions on their styles. Having read "Brew like a monk" and "Belgian Ale" I've been tempted to get my hands dirty. Over the long weekend I've put down two different Belgian Inspired beers. A Belgian Spiced and another of Dkershner's Belgian Tripels. They're already bubbling away really well, and although the temperature in Brisbane is currently very cold (9 - 20 degrees celcius) the fermentation is keeping the wort above 16 degrees during the cold nights and early mornings. For the Belgian Spiced Ale I used the "Delirium Tremens clone" as the basis for my beer. You'll find the recipe here http://www.homebrewtalk.com/f73/pink-elephant-delirium-tremens-clone-112957/ Although I wound back the grains of paradise as I was concerned the spice may dominate. I used the T-58 Fermentis yeast on this one. The Spiced Ale is kept in a tub with some ice packs during the day so that it doesn't get too warm. The Tripel is not being as closely controlled for temperature so I'll see how the S-33 yeast handles getting up around 24 degrees (wort temperature not ambient). First time using whirlfloc with these yeasts, hopefully it helps to clear them up a bit. This had a bit of yeast hanging around and some floaties made it into the bottles, some more than others. If I can find a bottle with low floaties content I'll submit it to the local IPA competition for feedback. If this beer turns out as good as I expect it could become a regular. This beer has been bottled last weekend. Will give an update on it's status in about 4 weeks. Once it has had time to carbonate and age a little. I used gelatine to clear up the suspended jaggery in this, it may have effected the end result. Have to wait and see. The Honey Ale has finished carbing up. Very nice flavour, not overly sweet and a good balance of honey flavour and hop bitterness. Deceptively easy to drink. Yesterday I also bottled up the Centennial IPA "The Ex". I think this will be a cracker of a brew. Sadly some yeast got into some of the bottles as I kept this vegan friendly by omitting the finings. I made up 6 bottles in the 330ml Schnitzerbrau bottles for some friends to try. I'm sure they'll go down a treat. The aroma from the Centennial hops is quite strong as is the bitterness, although I think the bitterness might drop a little as it carbs up. I hope to put this beer into a local brewing competition to get some unreserved feedback and to put it against gluten based beers. This beer has been in the fermenter for about 6 days now. A bit concerned that fermentation has stopped or slowed too much. I've got a current gravity reading of 1020 last night, so I pitched an aditional sachet of S-04 Yeast. Will see how that comes out. In future I'll be using whirlfloc with these belgian style triples. Flavour isn't impressing me at the moment but I'll wait till it's in the bottle before I decide. I'm happy to report that this beer still seems to be fermenting. Now at 1017, so I'll leave it alone for another two weeks before getting it in the bottle. Looks like I might have been too quick to be excited. I think this beer might be stuck at 1017. Will give it time to clear up, treat with gelatine and bottle in two weeks time. But I think this might be another failure. I don't think the Jaggery was as fermentable as I was expecting and I think I should have used whirlfloc in the boil. Will be using whirlfloc in all future brews. Edit: This looks like a failure at this point. I do not encourage anyone to replicate this. I got the idea for this beer from Randy Mosher's Radical Brewing and combining that with DKershner's Triple Blonde as the base. If you are looking to copy this recipe, please use cane sugar based version of Jaggery, not the palm sugar variant. My original recipe had the Jaggery at 500grams but I decided to roll it back a bit as I was brewing. Jaggery and Saffron Belgian Triple - aka "The Darjeeling Limited"
Yesterday I dry hopped the Centennial IPA with 10g of Centennial Hops. Very much looking forward to this beer. I tried one of the Honey Ale bottles yesterday. Still has more carbonation to happen but the initial taste on this is great. It is sweet with a strong flavour of honey, but I expect both of these features to reduce as the bottle fermentation takes place. Busy day today, bottled the Honey Beer which required pasteurised honey and brewed a Centennial Hopped IPA. The original recipe for the Centennial hopped ale is pulled from page 50 of the "250 Clone Brews" magazine. Centennial Hopped IPA aka "The Ex"
The original recipe has this beer finishing at 5%, I think this will finish around 4%. This is my first heavily hopped beer and will be my first dry hopped beer. The Centennial Hops are 9.2% AA. Big thanks to my wife for helping me clean up the malt extract I managed to get it all over the kitchen. The Australian Pale Ale (APA) is going down very easily. I was hoping the extra hops and more sugar would take away some of that sweet wine like flavours that were coming through before. The beer is definitely dryer which is just great. If I was to re-brew this, I'd probably add green tea (to add complexity) and maybe dry hop with the Australian Cluster hops. Will update with a picture once I get around to taking one. Edit: As promised, here is a picture. Sorry the flash didn't go off, but as you can see it is still quite clear. This recipe has been provided by DKershner. Hoping this makes a nice light coloured beer with a bit of a kick. Brew day went well. Due to my previous failure I was very thorough with the sterilisation, just to make sure no bugs ended up in the brew. This is my first brewing failure. I can only think that the cause of my issues was the rice malt. This brew smelled fantastic fermenting, but the taste is just horrible. Hopefully when I learn more about brewing I can work out what went wrong here. Yeast nutrient and Fermentis WB-06 Wheat beer yeast. 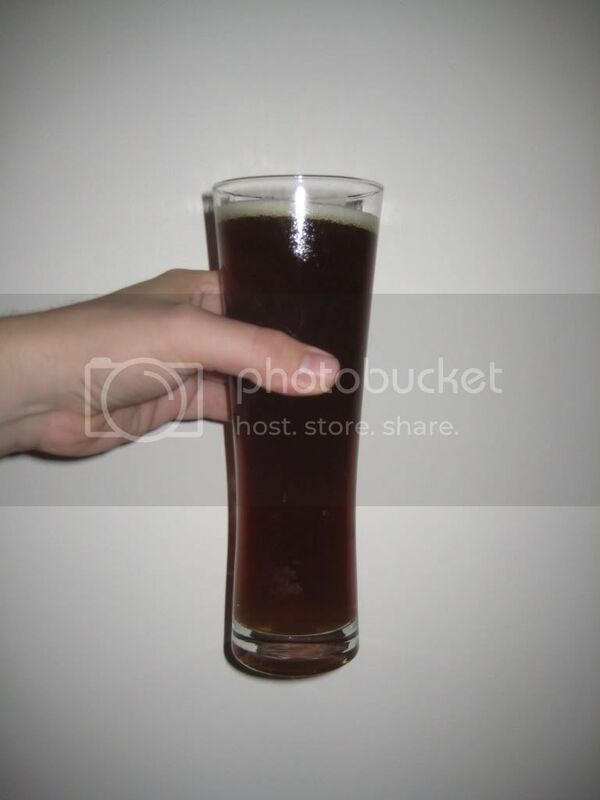 As you can see from the photo it has a very dark colour similar to a Belgian dubbel. Over the Christmas break I purchased a Gluten free pale ale kit from Brewers choice www.brewerschoice.com.au With hopes of making a beer that I would enjoy drinking I went about brewing up a batch. All the ingredients you require are included in the kit, yeast, malt, hops, yeast nutrient, whirlfloc tablet and finings. N.B. If you are brewing vegetarian/vegan beer omit the finings as they contain gelatine. The instructions were easy to follow, clearly detailing each step in the brewing process. The wort was boiled, cold crashed and put into the fermenter. Fermentation time was around two weeks. The beer was transferred to some sterilised bottles and left for a few weeks to carbonate. This was a fantastic beer after carbonation. The hops made for a very fruity beer that was very easy to drink. We had no trouble getting through the amount we had brewed. 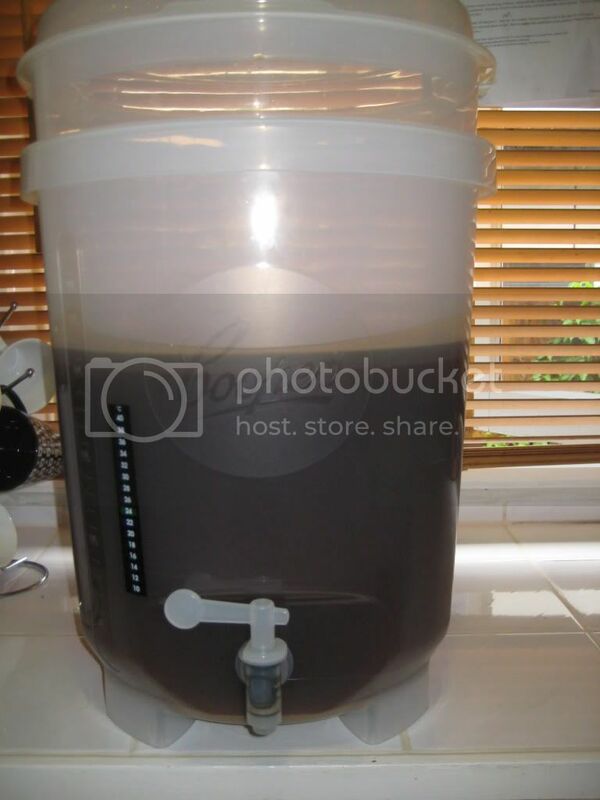 The kit was a very good way to learn the basics of extract brewing and has given me the confidence to try different recipes. Brewers Choice distribute these kits direct to the public in Queensland, and are carried by other stores in Australia and New Zealand. Contact Brewers Choice for your local distributor.